DETROIT/SAN FRANCISCO -- Concerns raised by the first reported fatality in a semi-automated car were expected to speed adoption of more sensitive technology to help vehicles see and drive themselves safely, increasing demand on the emerging autonomous vehicle technology industry, investors and analysts said. Goldman Sachs forecasts the market for advanced driver assistance systems and autonomous vehicles will grow from about $3 billion last year to $96 billion in 2025 and $290 billion in 2035. More than half of that revenue in 20 years, Goldman estimates, will come from radar, cameras and lidar, a sensor that uses laser - all tools considered essential to building vehicles that can pilot themselves. 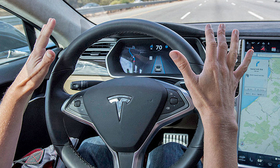 The May 7 death of Ohio technology company owner Joshua Brown in a Tesla Model S while the car's semi-automated autopilot system was engaged highlighted the limitations of current automated driving systems. "As we move to a higher level of autonomy in vehicles, you're going to want to have more redundancy," which radar and lidar can provide, Dan Galves, senior vice president at vision safety system maker Mobileye, said in an interview. "The more sensors, the better." Automakers have been using multiple sensors in prototypes that are in testing but not yet ready for market. A variety of technologies with overlapping capabilities is seen as a way to increase safety under a wider range of circumstances. Semi-automated systems such as General Motors' SuperCruise and Traffic Jam Pilot from Audi are due on the market in 2017-2018. Ford Motor expects to deploy a semi-automated system, using Velodyne lidar, in 2018. Toyota Motor Corp., which is investing more than $1 billion in such self-driving technologies as robotics and artificial intelligence, said it aims to put fully driverless cars on the road in time for the 2020 Tokyo Olympics. Delphi Automotive plans to build lidar vision systems with technology from Quanergy Systems, which makes solid state lidar systems. Delphi plans to combine information from the lidar system with radar and other driver assistance technology to create a 360-degree view around a car, a company official said. At least two of those startups - Quanergy which makes solid state lidar sensors, and Zoox, which is developing fully automated vehicle systems - have jumped in value to more than $1 billion each since GM's $1.2-billion acquisition earlier this year of another self-driving startup, Cruise Automation. Mobileye plans by 2020 to offer a hardware/software system that can gather, fuse and analyze data from 20 different sensors, including cameras, lidar and radar. The company's new EyeQ5 "system on chip" will be a key component in a fully autonomous driving system that is being jointly developed with BMW Group and Intel Corp. and is aimed at production in 2021. Like Mobileye, Velodyne, a leading supplier of laser-based lidar systems, works with many of the world's top automakers, including Ford, GM, BMW, Toyota Honda Motor Co. and Mercedes-Benz. "Our clients want to [combine] lidar and cameras," Velodyne's Marta Hall, president of business development, told Reuters in an interview. Automakers are stepping up orders as lidar systems come down in size and price, she said. Germany's Robert Bosch, which has been developing self-driving components and systems for more than 15 years, buys lidar from an unnamed Tier II supplier and intends to package it in a highly automated "highway pilot" system intended for series production in 2020, said spokesman Tim Wieland. Safety regulators and industry executives have said self-driving cars ultimately could slash traffic fatalities - about 35,000 last year in the U.S. and more than 1.2 million globally - by up to 90 percent. But regulators are also concerned that drivers could be lulled into unsafe behavior by systems that take control for a time, but expect human operators to re-take command in an emergency. Product liability for automated vehicles is uncharted territory. The U.S. Transportation Department has said an automated driving system could be considered the "driver" for regulatory purposes. A survey conducted by AlixPartners in June - before the Tesla accident was reported publicly - found that 90 percent of respondents would be interested in a self-driving car that would let the driver take the wheel from time to time. The same survey noted that nearly 80 percent of respondents would pay for the technology - including 10 percent who would spend up to $5,000.